1. any patch or flat area. 2. a superficial, solid, elevated skin lesion with a diameter equal to or greater than 1.0 cm (0.5 cm according to some authorities); see also papule. dental plaque a dense, nonmineralized, highly organized biofilm of microbes, organic and inorganic material derived from the saliva, gingival crevicular fluid, and bacterial byproducts. It plays an important etiologic role in the development of dental caries and periodontal and gingival diseases; calcified plaque forms dental calculus. fibrous plaque the lesion of atherosclerosis, a white to yellow area within the wall of an artery that causes the intimal surface to bulge into the lumen; it is composed of lipid, cell debris, smooth muscle cells, collagen, and, in older persons, calcium. Called also atheromatous plaque. Hollenhorst p's atheromatous emboli containing cholesterol crystals in the retinal arterioles. pleural p's opaque white plaques on the parietal pleura, visible radiographically in cases of asbestosis. senile p's microscopic lesions composed of fragmented axon terminals and dendrites surrounding a core of amyloid seen in the cerebral cortex in Alzheimer's disease. 1. A patch or small differentiated area on a body surface (for example, skin, mucosa, or arterial endothelium) or on the cut surface of an organ such as the brain; in skin, a circumscribed, elevated, superficial, and solid area exceeding 1 cm in diameter. 2. An area of clearing in a flat confluent growth of bacteria or tissue cells, such as that caused by the lytic action of bacteriophage in an agar plate culture of bacteria, by the cytopathic effect of certain animal viruses in a sheet of cultured tissue cells, or by antibody (hemolysin) produced by lymphocytes cultured in the presence of erythrocytes and to which complement has been added. 3. A sharply defined zone of demyelination characteristic of multiple sclerosis. 2. a superficial, solid, elevated skin lesion. attachment plaques small regions of increased density along the sarcolemma of skeletal muscles to which myofilaments seem to attach. bacterial plaque , dental plaque a soft thin film of food debris, mucin, and dead epithelial cells on the teeth, providing the medium for bacterial growth. It contains calcium, phosphorus, and other salts, polysaccharides, proteins, carbohydrates, and lipids, and plays a role in the development of caries, dental calculus, and periodontal and gingival diseases. fibrous plaque the lesion of atherosclerosis, a pearly white area within an artery that causes the intimal surface to bulge into the lumen; it is composed of lipid, cell debris, smooth muscle cells, collagen, and, in older persons, calcium. Hollenhorst plaques atheromatous emboli containing cholesterol crystals in the retinal arterioles, a sign of impending serious cardiovascular disease. senile plaques microscopic argyrophilic masses composed of fragmented axon terminals and dendrites surrounding a core of amyloid, seen in small amounts in the cerebral cortex of healthy elderly people and in larger amounts in those with Alzheimer's disease. 1. A scaly patch on a body part, especially the skin. 2. A biofilm of bacteria in a matrix of polysaccharides and other substances on the surface of a tooth or teeth. a. A deposit of fatty material on the inner lining of an arterial wall, characteristic of atherosclerosis. b. The material that such a deposit is composed of. 4. A deposit consisting mainly of beta-amyloid and degenerating nerve tissue, found in the brain tissue of people with Alzheimer's disease. 5. A sharply defined zone of demyelination in the central nervous system characteristic of multiple sclerosis. 6. A clear, often round patch of lysed cells in an otherwise opaque layer of a bacteria or cell culture. 1 a flat, often raised patch on the skin or any other organ of the body. 2 a patch of atherosclerosis. 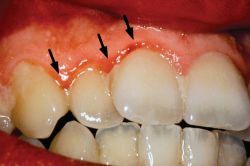 3 also called bacterial plaque, a usually thin film on the teeth. It is made up of mucin and colloidal material found in saliva and often secondarily invaded by bacteria. An early lesion of atherosclerosis which may be found in persons of any age in large vessels. A soft sticky substance on teeth composed of bacteria and saliva; an indurated soft mass of polysaccharides and bacteria—e.g., Lactobacillus acidophilus, Streptococcus mutans. A flat, solid, elevated, ≥ 1.0-cm-diameter skin nodule formed either by extension or coalescence of papules of lichen amyloidosis, lichen simplex chronicus, lichen planus, or psoriasis; a “plaque” stage occurs in certain skin tumours (e.g., the second stage of Kaposi sarcoma), and evolving mycosis fungoides. A clear area on a lawn of bacterial cells caused by the lysis of infected cells by a phage. Shadow plaques—one of multiple, irregularly shaped and sharply demarcated lesions (focal demyelinisation) in the gray and white matter in the brain of patients with multiple sclerosis. 1. A patch or small, differentiated area on a body surface (e.g., skin, mucosa, or arterial endothelium) or on the cut surface of an organ such as the brain. 2. An area of clearing in a flat, confluent growth of bacteria or tissue cells. 1. An area of ATHEROMA found in the inner lining of arteries in the disease of ATHEROSCLEROSIS. 2. A sticky mixture of food debris, saliva and bacteria that persists around the necks of uncleaned teeth and is the main cause of tooth decay. a clear area in a ‘lawn’ of bacterial growth, in which the bacteria have undergone LYSIS due to BACTERIOPHAGE infection. The number of plaque-forming units in a given volume applied to the lawn can be used to calculate viral numbers in a suspension. a layer that forms on the surface of a tooth, composed of bacteria in an organic matrix (see BIOFILM). As the layer thickens, anaerobic respiration of the bacteria produces acids which dissolve the tooth enamel. Patches of scar tissue that form where the layer of yelin covering the nerve fibers is destroyed by the multiple sclerosis disease process. 2. Patch or small, differentiated area on body surface (e.g., skin, mucosa, or arterial endothelium) or on cut surface of an organ. 3. An area of clearing in a flat, confluent growth of bacteria or tissue cells. mucin plaque, bacterial plaque. 2. deposits of cholesterol in the arteries, possibly causing disease. n.pl the gram-positive microorganisms occurring in early-developing plaque that are later replaced with filaments as the plaque matures. n the loosely attached subgingival plaque found in the epithelium of the periodontal pocket that consists of gram-negative microorganisms and white blood cells. n a plaque that develops in the pit and fissures of a tooth. n a thick, noncalcified mass of plaque situated inferior to the gingival margin. It may or may not be attached to the epithelium or tooth and may cover subgingival calculus. It cannot be removed with flow of saliva or water. It can calcify with minerals from the lamina propria's blood vessels and become subgingival calculus. n a thick, noncalcified mass of plaque superior to the gingival margin. It cannot be removed with flow of saliva or water. It may or may not cover supragingival calculus. It may appear on any surface in the oral cavity. It can calcify from salivary minerals and become supragingival calculus. It can be stained with disclosing solutions. See also disclosing solution. n a type of subgingival plaque that uses selective attachment factors and is located in the subgingival area. This type of plaque is implicated in the formation of caries of the root and eventual breakdown of the root (resorption). 2. a clear area of cell lysis caused by viral replication on a cell monolayer. small, 1 to 2 inch diameter, poxlike lesion on the inside of the amnion. Constant on the bovine amnion during the middle trimester and causes no problems. seen in equine lupus erythematosus panniculitis. a method of quantifying the number of infectious units by inoculating serial dilutions of a viral suspension on a cell culture monolayer, overlaying with a medium containing agarose and after several days incubation, counting the number of plaques formed; recorded as plaque forming units/ml. a deposit of predominantly fatty material in the lining of blood vessels occurring in atherosclerosis. a mass adhering to the enamel surface of a tooth, composed of a mixed colony of bacteria in an intercellular matrix of bacterial and salivary polymers and remnants of epithelial cells and leukocytes. It may cause caries, dental calculi and periodontal disease. an elevated, solid structure without a necrotic center, up to 1 to 2 inch diameter with an unbroken surface. cutaneous, subcutaneous or subconjunctival deposits formed as a result of injection of some drugs, particularly repository steroid preparations. May be unsightly and a cause of conjunctivitis. the number of plaques formed in the plaque assay. described in the brain of old dogs. nodules observed as dry, yellow encrustations on the splenic capsule of old dogs. History: A 5years old boy weighing 20kgs presented to us with skin colored to erythematous papules which coalesced to form annular plaques with a tendency to spread centrifugally with mild atrophy in the center. Upon inspection, she has pink and violaceous indurated annular plaques on her right nasal sidewall and cheek. Caption: The female teen has pink and violaceous indurated annular plaques on her right nasal sidewall and cheek. INTRODUCTION: Granuloma annulare is a benign cutaneous inflammatory disease of unknown etiology most commonly presenting on the hands and feet and consisting of asymptomatic to mildly pruritic, flesh-colored to erythematous annular plaques . A 45-year-old male patient, farmer by occupation, presented with multiple disseminated, light brown-colored, annular plaques with a raised hyperkeratotic ridge-like border with atrophic center distributed over sun exposed parts like V-area of neck, upper chest, extensor aspect of upper extremity. CASE REPORT: A 49 year old female has presented to the OPD with hyper pigmented, scaly, verrucous annular plaques with inflammatory borders.